SPECIAL! LIMITED TIME ONLY - $ 39.95 INCLUDING SHIPPING! The must have decking installation tool. 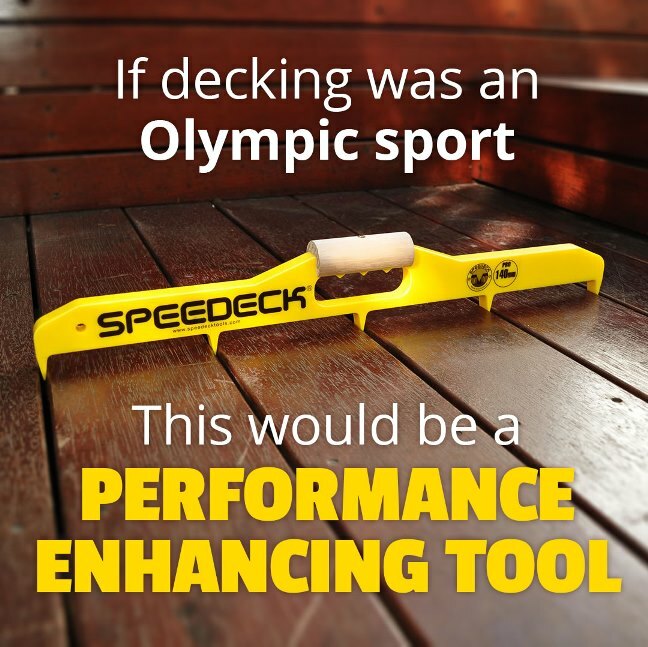 The Speedeck PRO is for the professional OR DIY trades person! 3.5" version is 3/4 inch thick and is designed for 3.5" (90mm) decking boards. It positions 5 boards at a time. The 5.5" tool is 3/4 inch thick and designed for 5.5" (140mm) decking boards . It positions 4 boards at a time. Speedeck features a Porta® Tasmanian Oak handle and V shaped Patented Teeth to the underside of the gauge. When positioning the tool, align the teeth between each of the decking boards and give it a firm tap of a hammer on both top edges of the tool. The teeth will then engage and set a 3/16 inch (4/5mm) gap approx. mid way on each tooth. How to use the Speedeck tool. TO BEGIN we always recommend that the first board be string lined providing a straight edge. This ensures the tool will work at its maximum capacity and provide an accurate and parallel structure. Simple tip: predrilling boards prior to installation, makes the job much easier when screwing or nailing to joists. Important: The Speedeck gauge must be appropriate to the width size board that will be installed. For example 90mm decking gauge requires the 90mm decking boards and will not work with 86mm boards. Watch the video to see how it is done!